Double click on this image. Wait for large image to open, then right click and choose ‘save as’ or ‘save image as’ to download. “Over the next couple of weeks, the Catholic Worker will be involved in spontaneous and organised nonviolent street demonstrations challenging the ongoing Irish complicity in U.S. and British wars on the people of Iraq and Afghanistan. 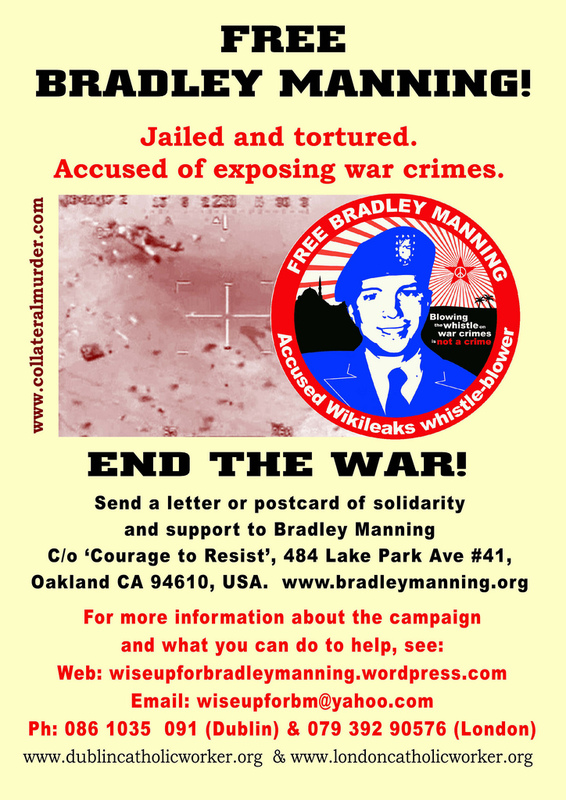 “Both Bradley Manning and Julian Assange are looking at spending a lifetime (and possibly being killed) in jail for releasing footage that exposes the true nature of these wars Ireland has been involved in for over a decade. These men have risked their liberty on the belief that, if only we knew the truth, we would act. If not us, who? If not now, when? “All CW events, like the movement itself, are based on nonviolence, inclusivity/hospitality, mutuality, respect for the faiths and non-faiths of others. Ciaron O’Reilly, London Catholic Worker. For more information call Ciaron in Dublin on 087 918 4552. ‘NO QUEEN, but Mary Queen of Heaven – single mum, refugee, role model for a revolutionary!’ Kicks off from Steps of the Four Courts at 6pm on 16 May. those who feel uncomfortable – can begin walking to the next stop and wait for the rest of us etc. PROCESSION VISUAL: single file procession led by image of Lady of Guadalupe. 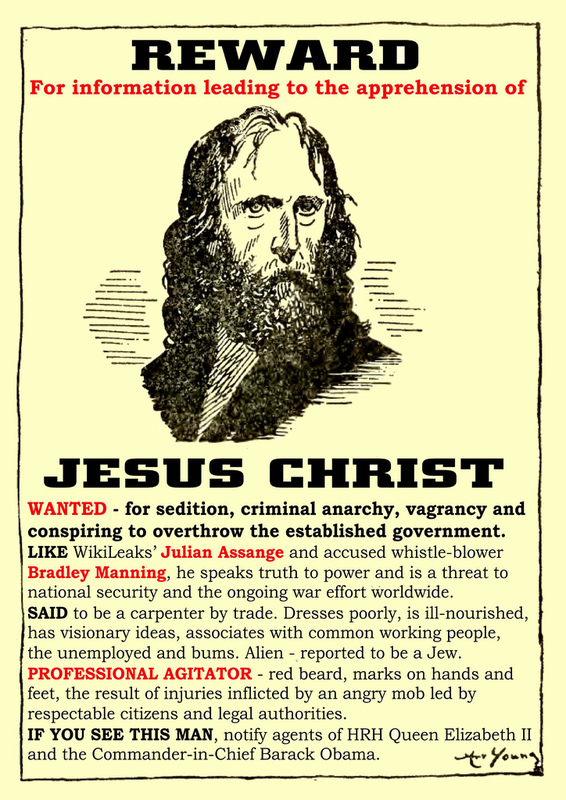 Signs for single file procession will include: ‘NO QUEEN’, ‘but Mary Queen of Heaven’, ‘single mum’, ‘refugee’, ‘role model for a revolutionary!’, plus images of Giuseppe Conlon and Bradley Manning. The event will look a bit like the Stations of the Cross we did in London on Good Friday. 6 pm START on steps of the Four Courts as the FIRST SORROWFUL MYSTERY with JB playing the “Giuseppe Conlon” song. END at Garden of Remembrance, Parnel Square, with JB playing The Welcome as the 5th and LAST SORROWFUL MYSTERY – the patriot dead sold out to the I.M.F. 2nd stop/ FIRST JOYFUL MYSTERY would be Merchants Quay (Franciscan church), outreach to homeless struggling with addiction, approaching R to play “Hurt” (a JOYFUL MYSTERY: something in the present worth celebrating that we can project into the future… towards an Ireland based on justice and peace). GLORIOUS – something from the past worth celebrating… Swift/ Gulliver’s Travels, Molly Malone statue, Phil Lynott statue off Grafton St, James Larkin statue on O’C St, Daniel O’Connell statue. Merchants Quay/ Acts of Mercy, Speakers Corner site Temple Bar, Moore St. multiculturalism. The mysteries won’t be in chronological order; the order will be determined by geography, eg the current order could be amended by Monday, may have more performers on board etc. Sorrowful 1 – Four Courts. Joyful 1 – Merchants Quay. Glorious 1 – Christchurch Cathedral… Jonathan Swift/ Gullivers Travels/ Leviathan analysis see Ched Myers. Sorrowful 2 – Dublin Castle, site of torture. Joyful 2 – Speakers Corner. Sorrowful 3 – Central Bank. Glorious 2 – Molly Malone statue. Glorious 3 – Phil Lynott Statue. Sorrowful 4 – The Dail. Glorious 4 – James Larkin statue. Joyful 3 – Moore St – Multiculturalism. Sorrowful 4 – Aviation Authority/ Shannon Airport as major hub for U.S. forces etc. etc. Glorious 5 – O’Connell statue. Sorrowful 5 – Garden of Remembrance. Related Link: Dublin Catholic Worker. Guess Who’s Coming to Dinner? Move over Liz and Obama. It’s the Catholic Worker in Dublin! by Ciaron, Giuseppe Conlon House, London. Dublin and London Catholic Workers have issued the flyer illustrated above for the visits of the British Queen (May 17-20) and U.S. President/ Commander in Chief Barack Obama (23 and 24 May). Double click on the images above. Wait for large image to open, then right click and choose ‘save as’ or ‘save image as’ to download. Print, copy and distribute. Designed to be printed double sided at A5 size. These two states are ten years into wars on the peoples of Afghanistan and Iraq, in which Ireland has played a significant role providing Shannon Airport as a refuelling hub for invading U.S. forces. We know through the recent WikiLeaks revelations that Shannon Airport also provided a stopover for torture flights to Guantanamo. Obama comes to Ireland around the first anniversary of the arrest of Bradley Manning, accused of releasing this Collateral Murder footage of a U.S. massacre in Iraq. Bradley has spent the past year being tortured in U.S. military custody in the hopes of breaking him so he will deliver Julian Assange. Bradley has refused to be broken. Bradley’s maternal grandfather was a Dubliner. The last place Bradley was not in custody, or in a war zone… was Shannon Airport, Ireland. We sent Bradley through our country to this war – Let’s bring him back! The visits of the Queen and Obama are very much a changing of the imperial guard, Ireland’s old and new colonisers passing each other. For Catholic Workers, one of the central theological questions remains: are you coming out of empire or are you heading into empire?… “You busy being born or busy dying?” (b.dylan). See this book review for further explanation. Over the next couple of weeks, the Catholic Worker will be involved in spontaneous and organised nonviolent street demonstrations challenging the ongoing Irish complicity in U.S. and British wars on the people of Iraq and Afghanistan. Both Bradley and Julian are looking at spending a lifetime (and possibly being killed) in jail for releasing footage that exposes the true nature of these wars Ireland has been involved in for over a decade. These men have risked their liberty on the belief that, if only we knew the truth, we would act. If not us, who? If not now, when? All CW events, like the movement itself, are based on nonviolence, inclusivity/hospitality, mutuality, respect for the faiths and non-faiths of others.